Cosmetic dentistry can help alleviate common dental problems that keep you from feeling confident about the way you look. At the office of James K. Lai, DDS, we help patients achieve more beautiful and radiant smiles with cosmetic dentistry in Corona, CA. Teeth Whitening – With in-office teeth whitening from Zoom!, we’re able to provide patients with beautifully whiter smiles in just one visit. Zoom! utilizes professional bleaching solution and a special light that activates stain lifting capacity, so your smile looks several shades whiter in one day. For patients who prefer to whiten their teeth from home, Dr. Lai offers take-home trays and whitening treatment from Opalesence. Opalesence is gentle on teeth for minimal post-treatment sensitivity. With trays that are created to fit your smile comfortably, whitening gel is localized to dental enamel to offer improved whitening results. White Fillings – Tooth-colored or resin fillings offer a more cosmetically appealing way to treat small spots of decay on teeth. Where traditional treatment for cavities includes the use of silver amalgam, composite resin matches the color of natural teeth and does not create an obvious dark mark on your smile. Veneers – Cosmetic veneer treatment is often the best way to correct a myriad of aesthetic dental problems, without the hassle of complex procedures and many returns visits for care. Veneers are thin sheets of porcelain that are bonded over the fronts of teeth, which allow them to look free of decay, chips, cracks, and deep stains. Veneers can also help misshapen teeth look more balanced in comparison with the rest of your smile, for an overall enhanced look. Veneer treatment typically takes only two visits and is a non-invasive cosmetic dental procedure for completely transforming your smile. Crowns – When teeth in your smile are severely decayed and are detracting from your appearance and oral health, tooth-colored dental crowns can help restore your smile. Our Corona cosmetic dental office uses all-porcelain, zirconia, and e-max® dental crowns for the best in natural aesthetics and long-lasting treatment. In addition to treatments for restoring teeth by treating decay and flaws to reveal a more beautiful smile, Dr. Lai offers clear braces to help re-align crowded and gapped teeth. Clear braces offer the most cosmetically attractive orthodontic treatment option for correcting misaligned teeth, without the aesthetic distraction of metal appliances. Invisalign® - With Invisalign® in Corona, CA, Dr. Lai is able to help patients achieve straighter, beautiful smiles. 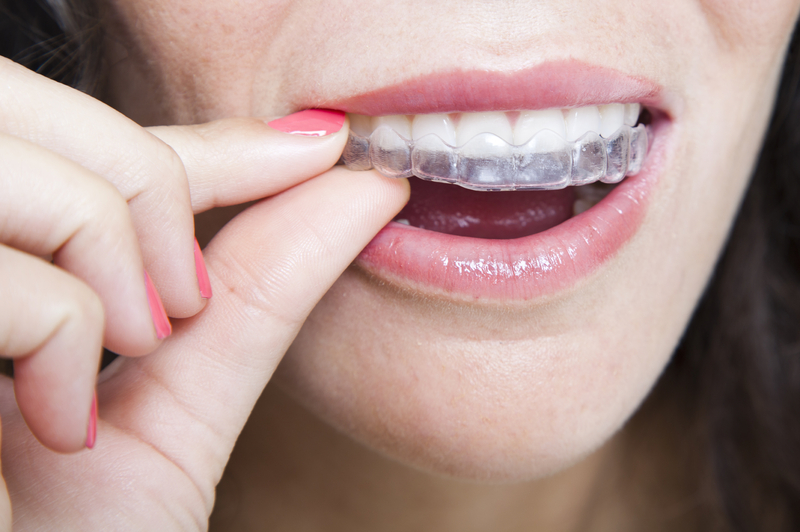 Invisalign® uses clear aligner trays that virtually disappear when worn, so you can feel good about your smile while undergoing treatment. Invisalign® is capable of treating mild to moderate teeth misalignment is and popular among adult patients who are committed to achieving best results. MTM® Clear•Aligner by 3M – Referred to as a treatment for minor tooth movement (MTM), these clear aligners supplied by 3M are ideal for shorter treatment plans and more mild instances of aesthetic teeth misalignment. Because 3M MTM® clear•aligners are intended to be used in short series, they are often a more affordable way to get the smile you want without extensive treatment. To learn more about cosmetic dentistry in Corona, call our office today to schedule your treatment consultation.